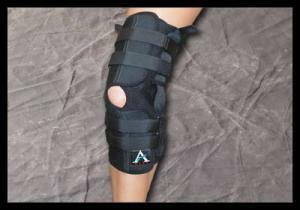 This ALPS Knee Brace is constructed of our Coolfit Breathable Fabric. The brace is designed to prevent or reduce the severity of knee injury. The Coolfit is available in Pull-on and wrap-around style. This knee brace is manufactured longer in length than our standard brace. Measurement taken 4 inches (10cm) above the top of the kneecap while standing.